I've taken on this type of project once before....and I have to say, next to creating my own designs, re-styling an existing gown into a "new creation" may be my new runner up. Don't get me wrong, I have my share of angst about ripping apart, cutting, removing, taking in, letting out what was Mom's bridal gown, but when it's all said and done and the bride is tickled with the result, it's all worth it! It really tugs on my heart when a bride wants to incorporate a special keepsake into her wedding day, be it something of a special Aunt, Grandma or Mom. 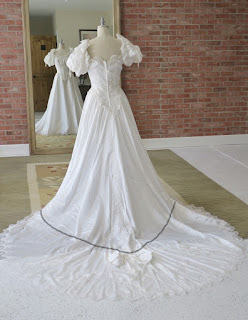 I've worked with heirloom veils, and garters many times, but when it turns out she hopes to be able to wear Mom's gown on her big day, well that's extra special! So below is my most recent project. Let's start with a picture of Mom's circa 1980's satin gown, with the large Princess Diana sleeves, dropped waist, and elaborate beading. Our first step was deciding what the bride wanted to keep and what she wanted to update. 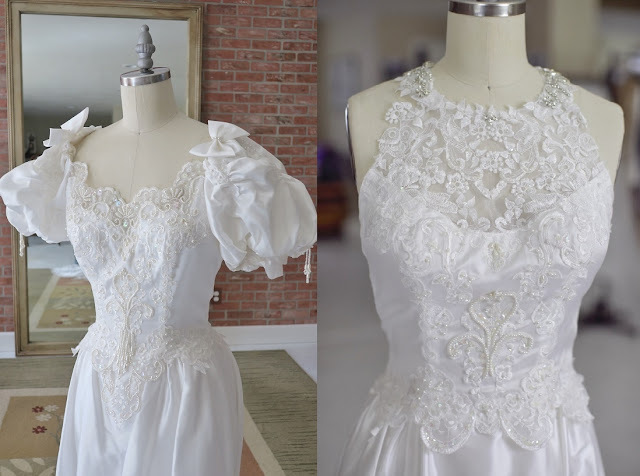 As you can imagine, the sleeves had to go, she also wanted a much shorter train since her wedding is taking place on a beach, and she had an idea already for the back bodice. Step One-the Train.....this was an easy starting point. To convert the gown to a "sweep" train, you'll see in the picture to the left I eliminated everything below the line I drew. There was an obvious point to make the cut just above the large bow. I then had to remove the lace from the hem and re-stitch it to the new hem. I took one of the bows from the sleeves and we added that about at the center back, about 3/4 of the way down. 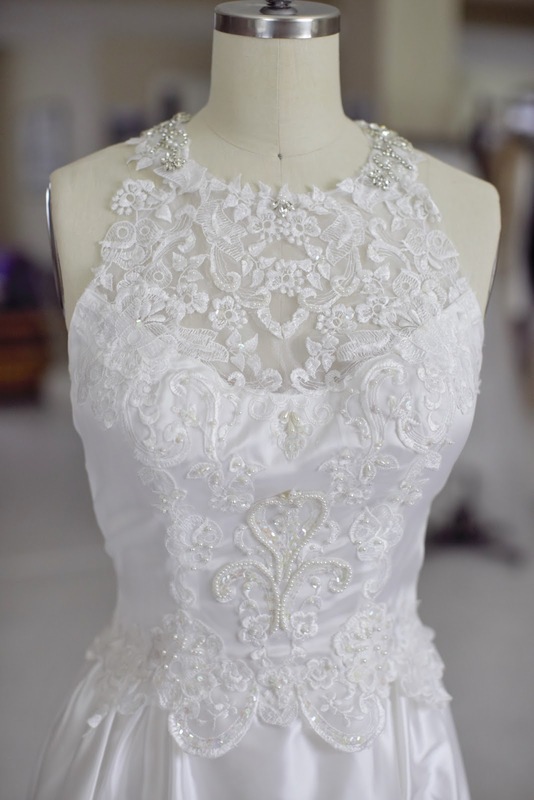 If you look closely at the large picture above you'll see a large number of lace appliques all over the train. 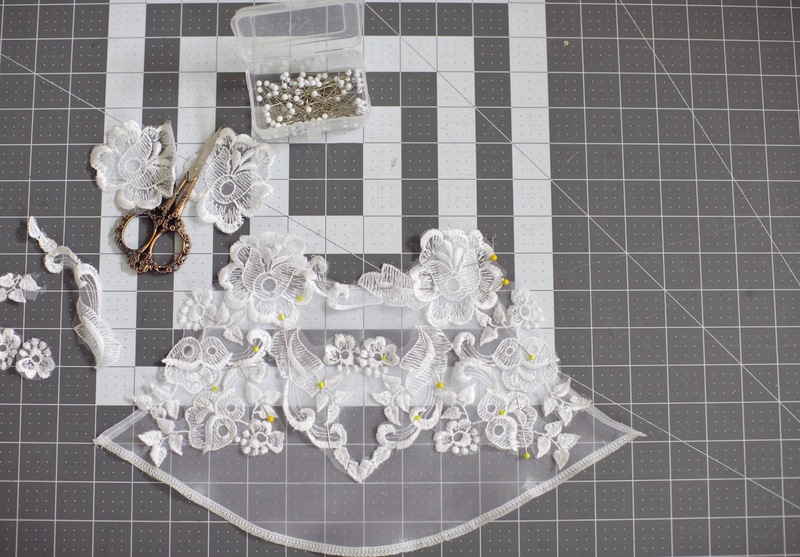 I ended up removing most of those and used them to create the new bodice. 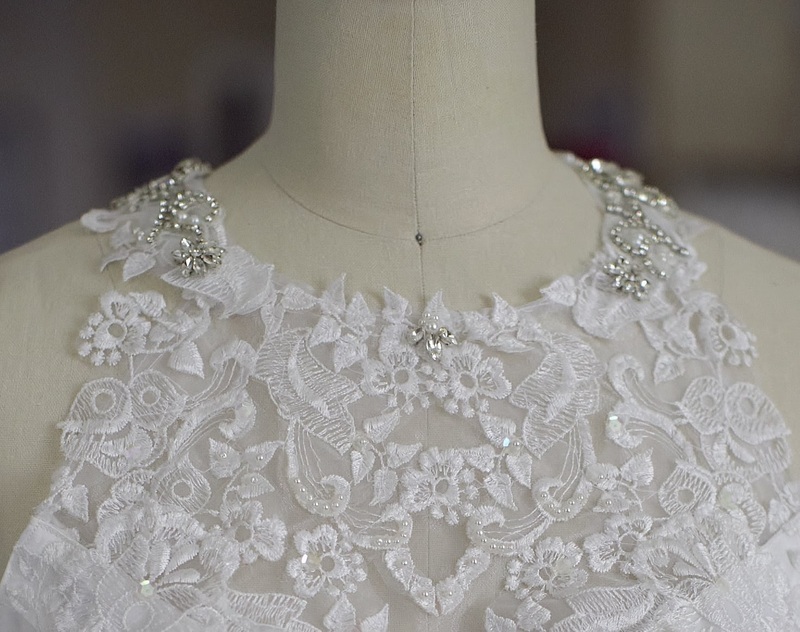 Step Two-Front and Back Bodice....Kat knew she wanted an open back with a beaded applique' as the focal point. She was able to share some pictures of what she was hoping for and I went to work trying to find something online that I could incorporate. As for the front of the bodice, she was looking for input because she really didn't know what to do. After giving it some thought, I presented her with an idea for a halter neck bodice. I felt it would blend well with the "racer back" look for the back of the gown. Step Three-the Skirt....the dress fit really well. I only had to take the bust in along the side seams just a smidge, but the waist and length were perfect! Kat liked the vintage feel of the dropped waistline, so we kept that, and she shared that she liked having some of the original beading and sequins as well. So.....with that in mind I went to work......I used an organza as my base fabric for the halter neckline and added the appliques' from the train to create a light and airy bodice. 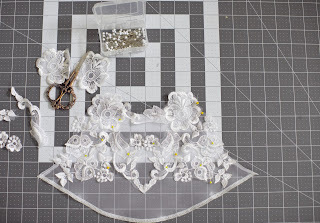 I literally cut apart the appliques' and pieced them into a new pattern. I added some pearls and sequins that I removed from the original gown where the beading was really heavy which allowed the "old" and the "new" to blend together. 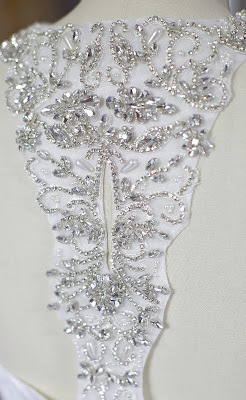 On either side of the neck you can see some beading, this is from the applique' which was used for the back. The applique' for the back I cut into the shape I needed to make it narrower at the shoulder blades. I chose to create a little "keyhole" at the center back and built the shape I needed for the "wraparound" pieces at the neckline. Before sewing it onto the gown, I had to lower the the back bodice which also meant removing the zipper and re-setting it once I had the right line. 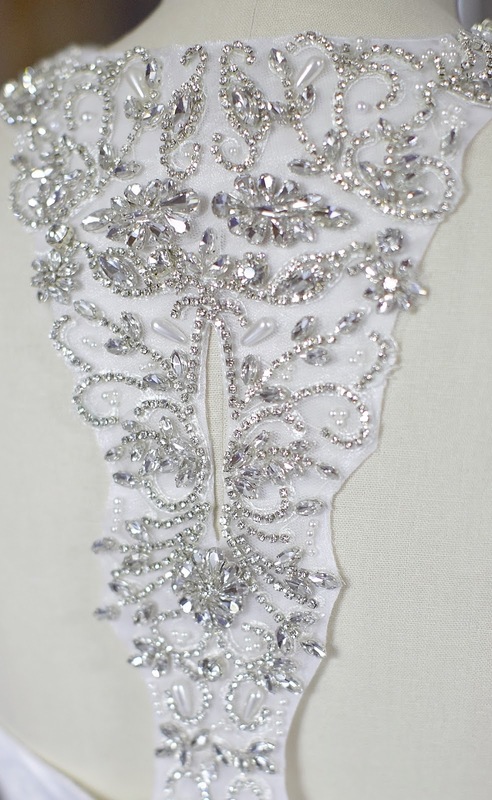 Since the original gown's embellishments were mostly pearls, I incorporated some that I had removed into the racer back motif. In case you're wondering how much time this took me....it was 18.25 hours. I have to say, I love the transformation on this gown. 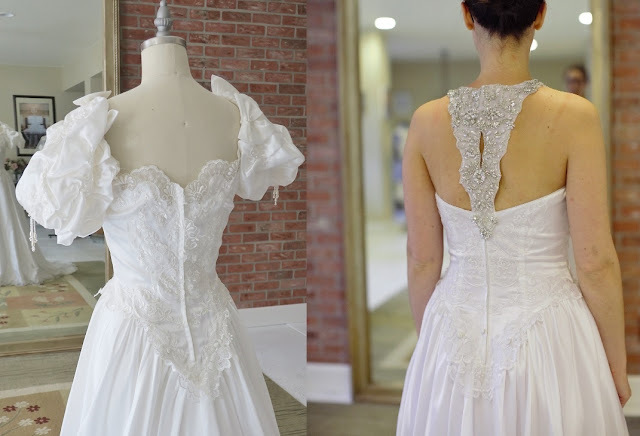 It truly illustrates how you can transform a gown into an updated version of the original, and what a wonderfully sentimental way for the second generation of bride to honor the first generation!